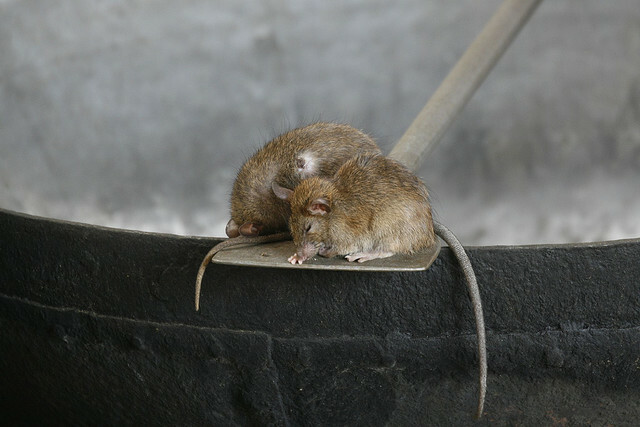 Inhabited, too, is the correct word for this is no accidental infestation. 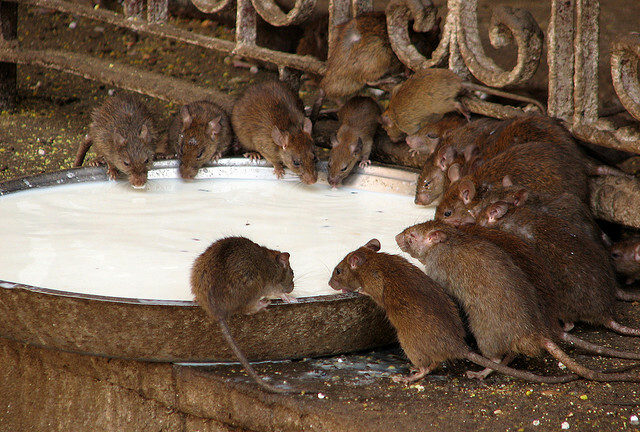 The Hindu adherents encourage their presence as we might other mammalian visitors to our gardens with sustenance both liquid and solid. 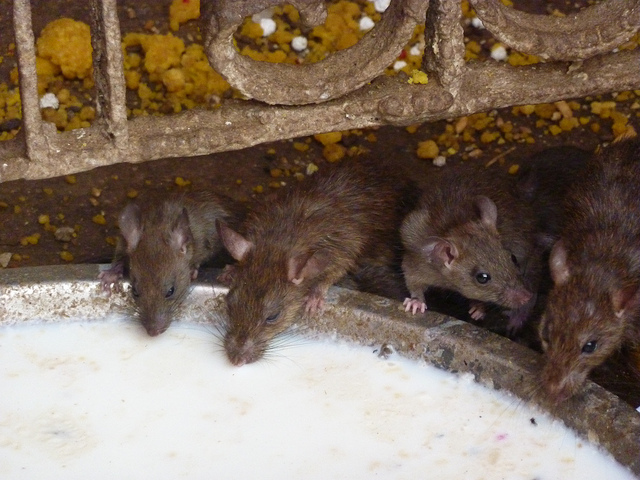 They are there in memory of a remarkable woman – Karni Mata. Back in the fourteenth century (almost a blink of the eye in terms of Indian history) there emerged from the charan caste a woman named Karni Mata. Highly revered, the women of the caste are venerated as mother goddesses by the other main communities of this province. This particular sage, however, was worshipped as an incarnation of a goddess, Durga. Durga is a form of the supremely radiant goddess, Devi and translates as one who can redeem in situations of utmost distress’. She exists in a condition known as svātantrya which is one of total independence from the universe. Durga is considered by Hindus to be the personification of feminine creativity, encompassing fearlessness, patience, compassion and even humor. 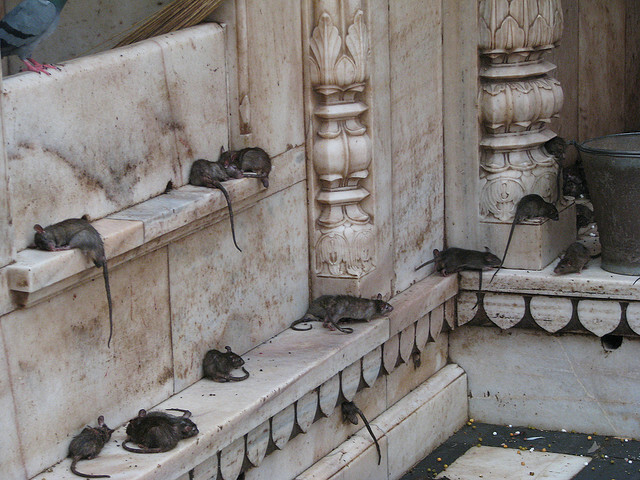 Little wonder, then, that wherever Karni Mata journeyed, temples sprang up. 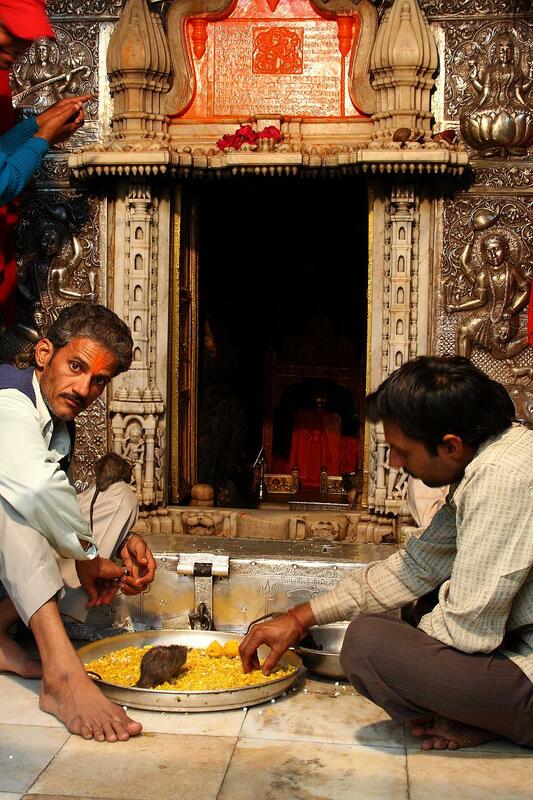 Humility, too: you will never find an original image of Karni Mata in any of the numerous temples dedicated to her. However, there is a record of her foot-print in each temple, hidden from the view of non believers. 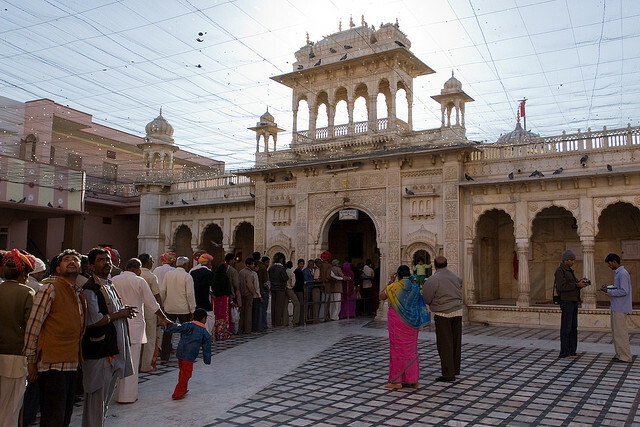 The temple at Deshnoke is by far the most famous (it is known locally as The Eighth Wonder – her followers on occasion lack her unassuming nature). 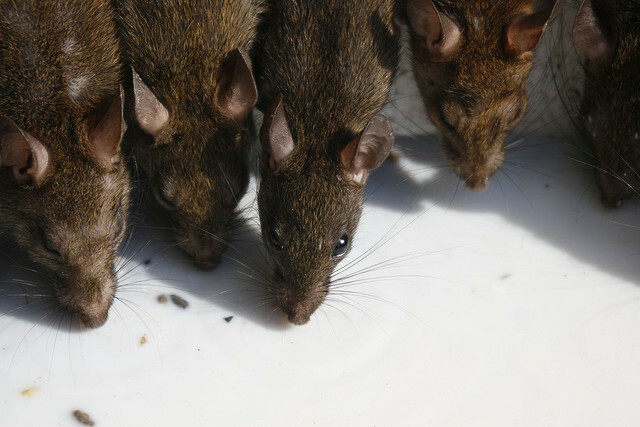 The reason is by now obvious – it is because of the rats. 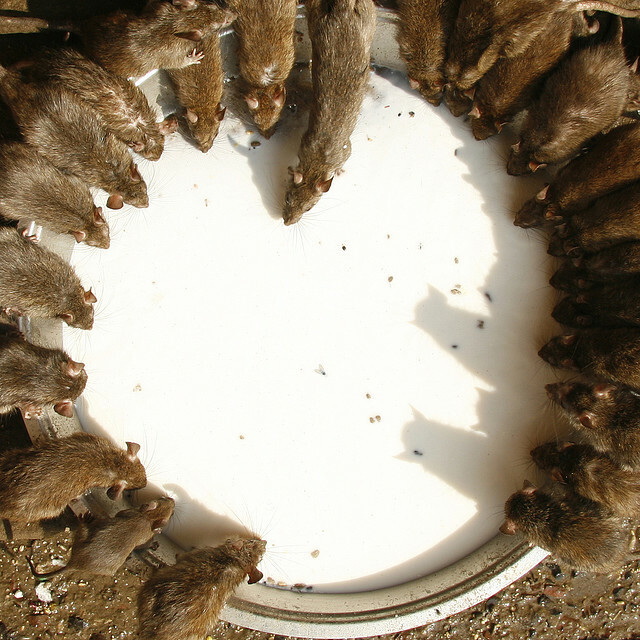 The rats eat from huge metal bowls filled with milk, sweets, and grains donated by devotees. 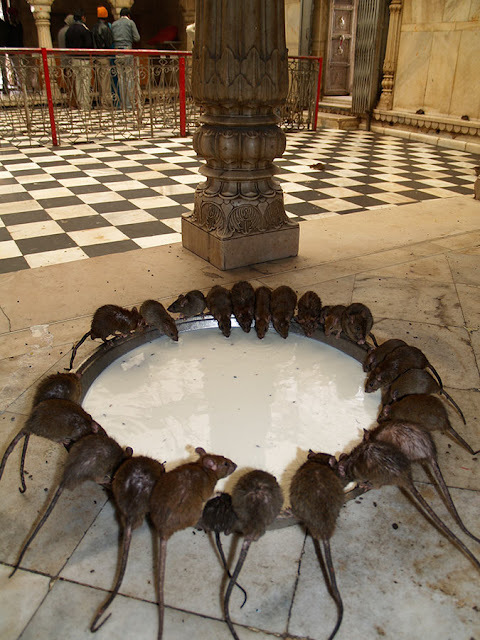 It is considered auspicious to see a white rat near the image of Karni Mata which were placed in the temple when it was rebuilt a hundred years ago. 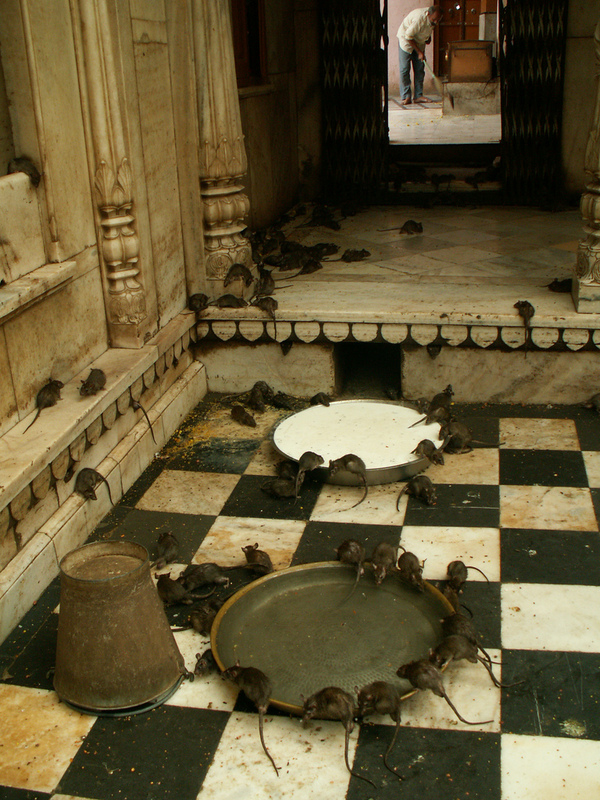 Pilgrims arrive throughout the year to pay tribute to Karni Mata and the sacred rats. During the Navratri festival of dance and celebration, which is held four times a year, the numbers significantly swell as thousands of religious travellers arrive on foot. 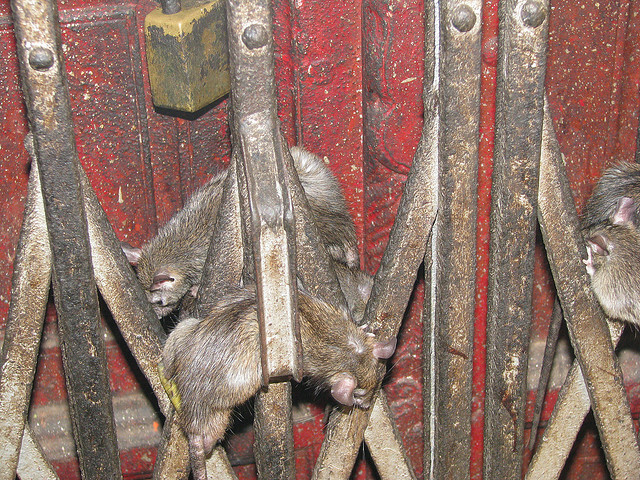 Yet, why rats? 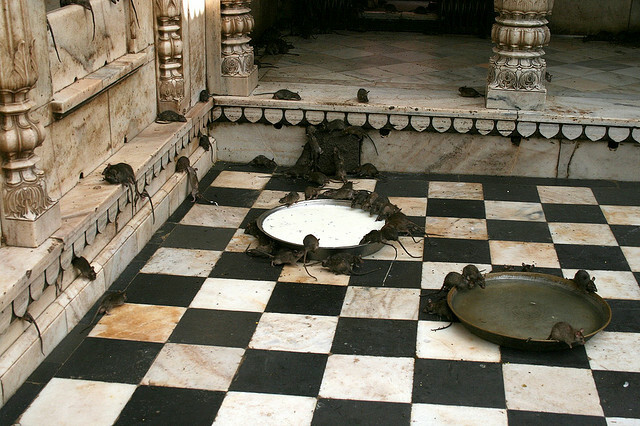 Why are these animals so significant to the adherents of Karni Mata. 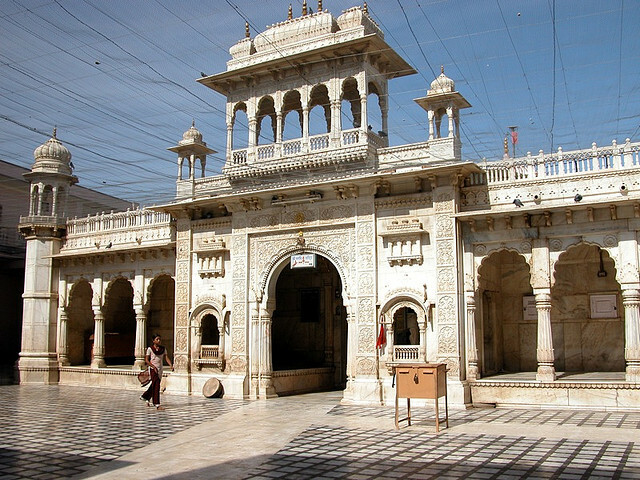 Legend has it that a favorite boy, the son of one of Karni Mata’s storytellers and someone who she regarded as a stepson, died. As Durga, Karni Mata implored the god of death, Yama, to bring him back to life. 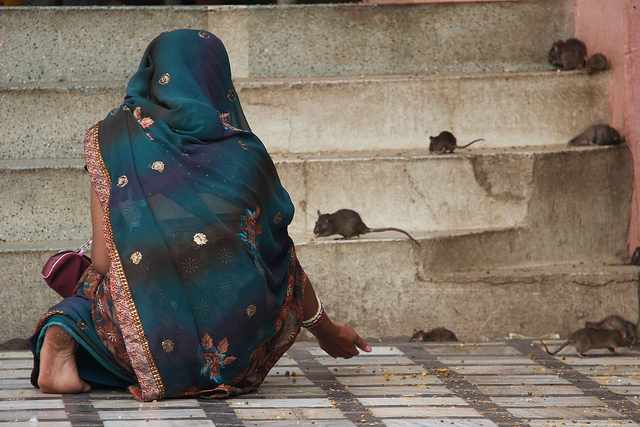 When this request was turned down, Kami Mata brought the cherished boy back as a rat – but not only him, all the storytellers too. 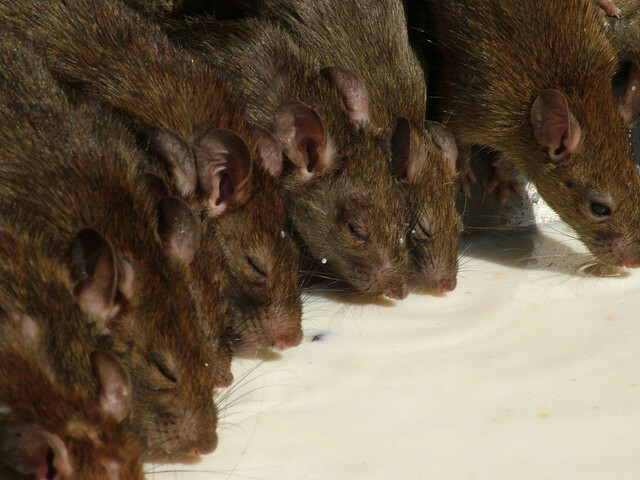 The rats became holy and have been treated as such ever since. 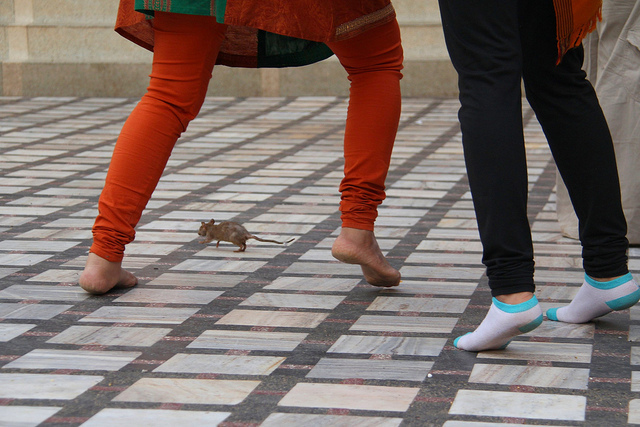 To avoid accidentally stepping on a rat is not a sign of squeamishness. If one is accidentally killed it must be reinstated with one made from solid gold. 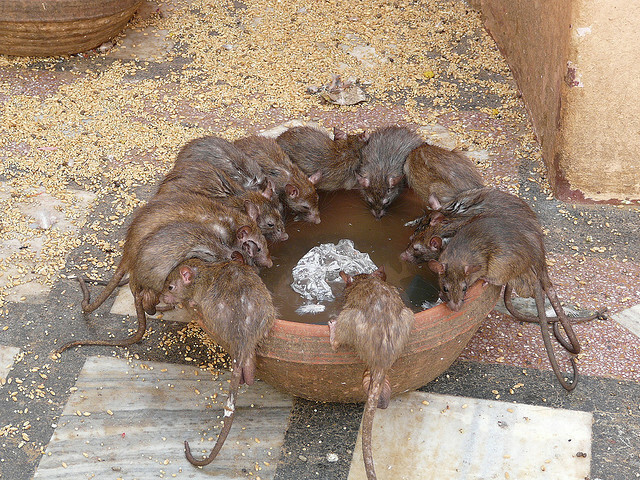 You really do not want to tread on these rats if you value the contents of your bank account. 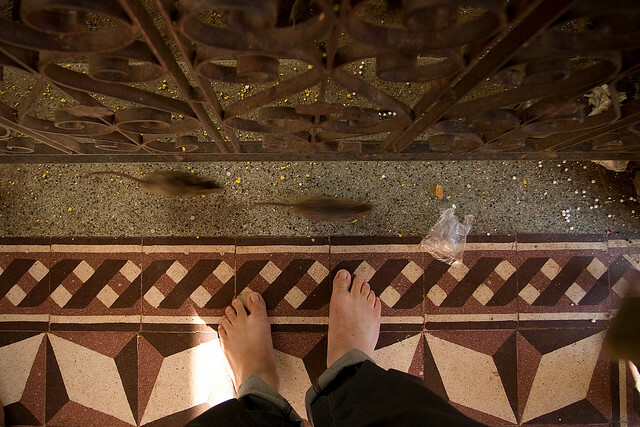 However, it is considered immense good luck if one of the rats chooses to scurry over you bare feet. ...or indeed if some join you for lunch (you have seen the one in the bowl, now look on the knee of the gentleman on the left). 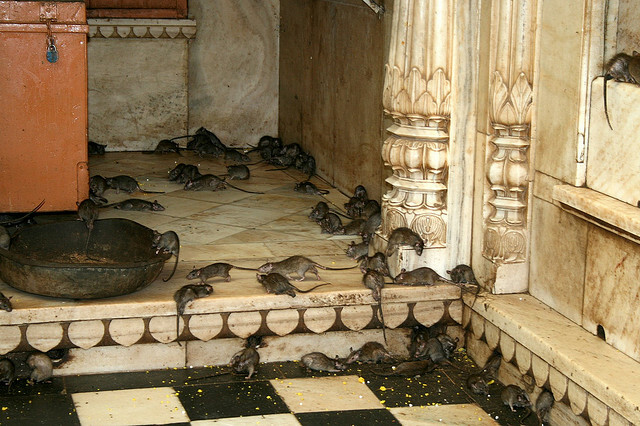 Notice the nets above the heads of the worshippers? 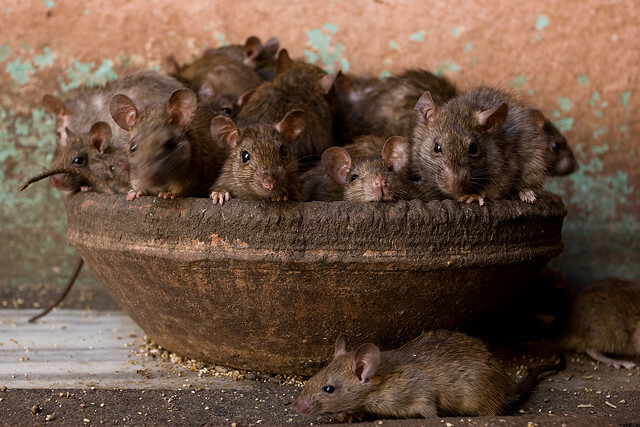 This is to protect the rats from an adversary that has no respect for their previous incarnation. Pigeons, given the chance, will happily swoop down and kill baby rats. 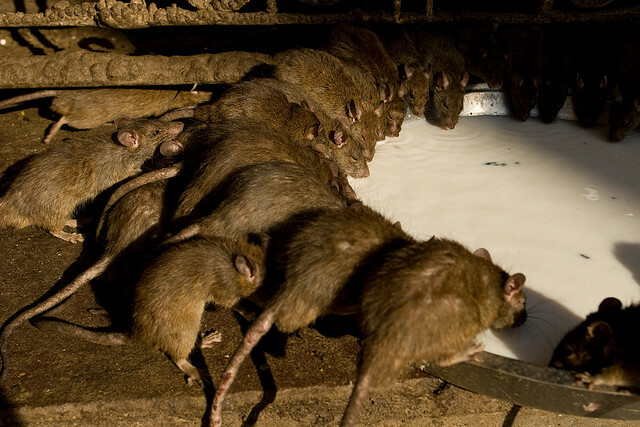 Don't worry - the rats in the pictures above and below are not dead. 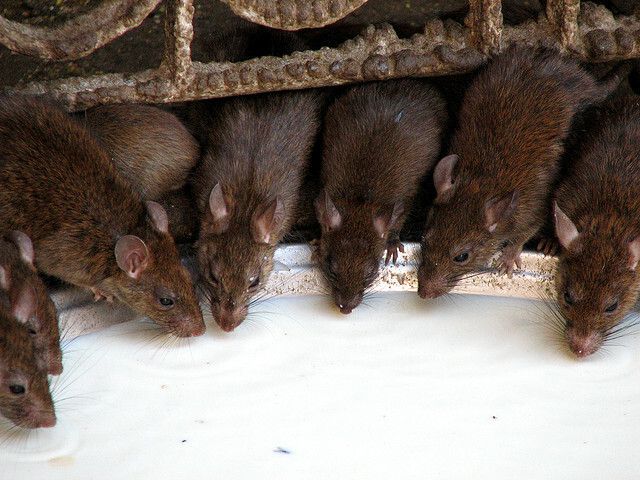 The rats are not tame but they are so used to humans trailing in and out that they have become oblivious to their presence. They know, too, that they are protected and this has led to fearlessness of which even Durga would approve! 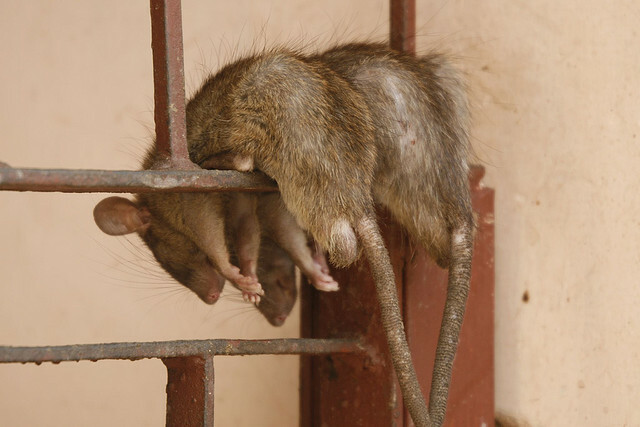 As mentioned before, the rats above are not dead but simply asleep – dozing peacefully completely in the open in the full knowledge that they will be unharmed. For now, though, let's leave them to their feast.